'Normal Science and its Dangers', in I. Lakatos and A. Musgrave (eds. ), Criticism and the Growth of Knowledge (1970), 52-3. [About describing atomic models in the language of classical physics:] We must be clear that when it comes to atoms, language can be used only as in poetry. The poet, too, is not nearly so concerned with describing facts as with creating images and establishing mental connections. As quoted by Werner Heisenberg, as translated by Arnold J. Pomerans, in Physics and Beyond: Encounters and Conversations (1971), 41. The words are not verbatim, but as later recollected by Werner Heisenberg describing his early encounter with Bohr in 1920. In Modern Astrophysics (1924), Preface, v.
Letter to Henry Fawcett (18 Sep 1861). In Charles Darwin, Francis Darwin, Albert Charles Seward, More Letters of Charles Darwin (1903), Vol. 1, 195. By an application of the theory of relativity to the taste of readers, today in Germany I am called a German man of science, and in England I am represented as a Swiss Jew. If I come to be regarded as a bête noire the descriptions will be reversed, and I shall become a Swiss Jew for the Germans and a German man of science for the English! Times (28 Nov 1919). In Robert Andrews Famous Lines: a Columbia Dictionary of Familiar Quotations (1997), 414. Variations of this quote were made by Einstein on other occasions. 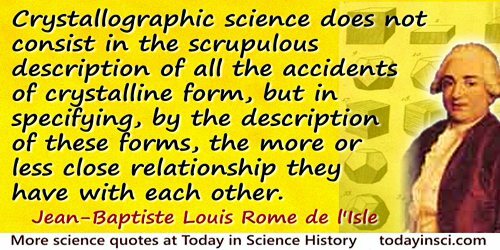 Crystallographic science does not consist in the scrupulous description of all the accidents of crystalline form, but in specifying, by the description of these forms, the more or less close relationship they have with each other. Do not the Rays which differ in Refrangibility differ also in Flexibity; and are they not by their different Inflexions separated from one another, so as after separation to make the Colours in the three Fringes above described? And after what manner are they inflected to make those Fringes? Opticks (1704), Book 3, Query 2, 132-3. Even for the physicist the description in plain language will be a criterion of the degree of understanding that has been reached. In Physics and Philosophy: The Revolution in Modern Science (1958, 1962), 168. Freudian psychoanalytical theory is a mythology that answers pretty well to Levi-Strauss's descriptions. It brings some kind of order into incoherence; it, too, hangs together, makes sense, leaves no loose ends, and is never (but never) at a loss for explanation. In a state of bewilderment it may therefore bring comfort and relief … give its subject a new and deeper understanding of his own condition and of the nature of his relationship to his fellow men. A mythical structure will be built up around him which makes sense and is believable-in, regardless of whether or not it is true. From 'Science and Literature', The Hope of Progress: A Scientist Looks at Problems in Philosophy, Literature and Science (1973), 29. I would rather have a mineral ill-classified and well-described, than well-classified and ill-described. If we knew all the laws of Nature, we should need only one fact or the description of one actual phenomenon to infer all the particular results at that point. Now we know only a few laws, and our result is vitiated, not, of course, by any confusion or irregularity in Nature, but by our ignorance of essential elements in the calculation. Our notions of law and harmony are commonly confined to those instances which we detect, but the harmony which results from a far greater number of seemingly conflicting, but really concurring, laws which we have not detected, is still more wonderful. The particular laws are as our points of view, as to the traveler, a mountain outline varies with every step, and it has an infinite number of profiles, though absolutely but one form. Even when cleft or bored through, it is not comprehended in its entireness. In any conceivable method ever invented by man, an automaton which produces an object by copying a pattern, will go first from the pattern to a description to the object. It first abstracts what the thing is like, and then carries it out. It’s therefore simpler not to extract from a real object its definition, but to start from the definition. Understanding Media: the Extensions of Man? (2nd Ed.,1964), 25. Referring to the need to improve the quality and status of applied science. From his essay contributed to the National Academy of Sciences Committee Report to the House Committee on Science and Astronautics (Mar 1965). Reprinted in 'The Role of Applied Science', Bulletin of the Atomic Scientists (Mar 1966). It is good to recall that three centuries ago, around the year 1660, two of the greatest monuments of modern history were erected, one in the West and one in the East; St. Paul’s Cathedral in London and the Taj Mahal in Agra. Between them, the two symbolize, perhaps better than words can describe, the comparative level of architectural technology, the comparative level of craftsmanship and the comparative level of affluence and sophistication the two cultures had attained at that epoch of history. But about the same time there was also created—and this time only in the West—a third monument, a monument still greater in its eventual import for humanity. This was Newton’s Principia, published in 1687. Newton's work had no counterpart in the India of the Mughuls. 'Ideals and Realities' (1975). Reprinted in Ideals and Realities (1984), 48. No language which lends itself to visualizability can describe the quantum jumps. As quoted in epigraph, without citation, in Nick Herbert, '“And Then A Miracle Occurs”: The Quantum Measurement Problem', Quantum Reality: Beyond the New Physics (1985), Chap 8, 131. No matter how we twist and turn we shall always come back to the cell. The eternal merit of Schwann does not lie in his cell theory that has occupied the foreground for so long, and perhaps will soon be given up, but in his description of the development of the various tissues, and in his demonstration that this development (hence all physiological activity) is in the end traceable back to the cell. Now if pathology is nothing but physiology with obstacles, and diseased life nothing but healthy life interfered with by all manner of external and internal influences then pathology too must be referred back to the cell. One might describe the mathematical quality in Nature by saying that the universe is so constituted that mathematics is a useful tool in its description. However, recent advances in physical science show that this statement of the case is too trivial. 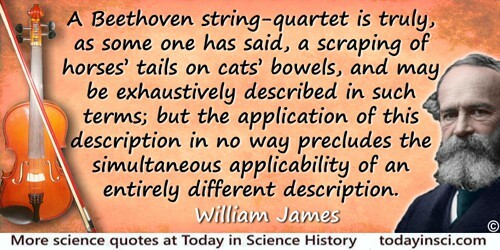 The connection between mathematics and the description of the universe goes far deeper than this, and one can get an appreciation of it only from a thorough examination of the various facts that make it up. Open to lawful traffic of all descriptions without toll charges. From the Proclamation by the Lincoln Highway Association (13 Sep 1913), announcing the route of the Lincoln Highway. In the Lincoln Highway Association, The Lincoln Highway: the Story of a Crusade That Made Transportation History (1935), 61. Science gives us the grounds of premises from which religious truths are to be inferred; but it does not set about inferring them, much less does it reach the inference; that is not its province. It brings before us phenomena, and it leaves us, if we will, to call them works of design, wisdom, or benevolence; and further still, if we will, to proceed to confess an Intelligent Creator. We have to take its facts, and to give them a meaning, and to draw our own conclusions from them. First comes Knowledge, then a view, then reasoning, then belief. This is why Science has so little of a religious tendency; deductions have no power of persuasion. The heart is commonly reached, not through the reason, but through the imagination, by means of direct impressions, by the testimony of facts and events, by history, by description. Persons influence us, voices melt us, looks subdue us, deeds inflame us. Many a man will live and die upon a dogma; no man will be a martyr for a conclusion. Letter collected in Tamworth Reading Room: Letters on an Address Delivered by Sir Robert Peel, Bart., M.P. on the Establishment of a Reading Room at Tamworth (1841), 32. Excerpted in John Henry Newman, An Essay in Aid of a Grammar of Assent (1870), 89 & 94 footnote. Scientists often invent words to fill the holes in their understanding.These words are meant as conveniences until real understanding can be found. … Words such as dimension and field and infinity … are not descriptions of reality, yet we accept them as such because everyone is sure someone else knows what the words mean. In God’s Debris: A Thought Experiment (2004), 20-21. From Principia Mathematica, Book 1, in Author’s Preface to the translation from the Latin by ‎Andrew Motte, as The Mathematical Principles of Natural Philosophy (1729), Vol. 1, second unpaginated page of the Preface. The empirical domain of objective contemplation, and the delineation of our planet in its present condition, do not include a consideration of the mysterious and insoluble problems of origin and existence. 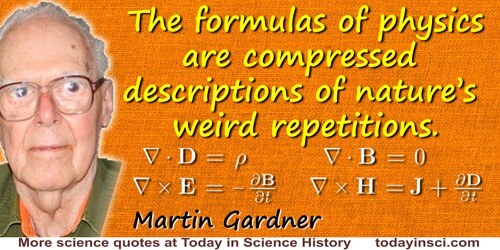 The mathematical formulation of the physicist’s often crude experience leads in an uncanny number of cases to an amazingly accurate description of a large class of phenomena. This shows that the mathematical language has more to commend it than being the only language which we can speak; it shows that it is, in a very real sense, the correct language. In 'The Unreasonable Effectiveness of Mathematics in the Natural Sciences,' Communications in Pure and Applied Mathematics (Feb 1960), 13, No. 1 (February 1960). Collected in Eugene Paul Wigner, A.S. Wightman (ed. ), Jagdish Mehra (ed. ), The Collected Works of Eugene Paul Wigner (1955), Vol. 6, 542. The mathematical framework of quantum theory has passed countless successful tests and is now universally accepted as a consistent and accurate description of all atomic phenomena. The verbal interpretation, on the other hand – i.e., the metaphysics of quantum theory – is on far less solid ground. In fact, in more than forty years physicists have not been able to provide a clear metaphysical model. In The Tao of Physics (1975), 132. The other line of argument, which leads to the opposite conclusion, arises from looking at artificial automata. Everyone knows that a machine tool is more complicated than the elements which can be made with it, and that, generally speaking, an automaton A, which can make an automaton B, must contain a complete description of B, and also rules on how to behave while effecting the synthesis. So, one gets a very strong impression that complication, or productive potentiality in an organization, is degenerative, that an organization which synthesizes something is necessarily more complicated, of a higher order, than the organization it synthesizes. This conclusion, arrived at by considering artificial automaton, is clearly opposite to our early conclusion, arrived at by considering living organisms. The theory of the earth is the science which describes and explains changes that the terrestrial globe has undergone from its beginning until today, and which allows the prediction of those it shall undergo in the future. The only way to understand these changes and their causes is to study the present-day state of the globe in order to gradually reconstruct its earlier stages, and to develop probable hypotheses on its future state. Therefore, the present state of the earth is the only solid base on which the theory can rely. In Albert V. Carozzi, 'Forty Years of Thinking in Front of the Alps: Saussure's (1796) Unpublished Theory of the Earth', Earth Sciences History (1989), 8 136. There is beauty in discovery. 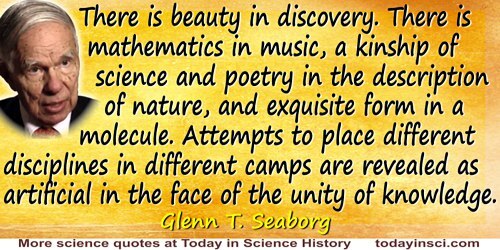 There is mathematics in music, a kinship of science and poetry in the description of nature, and exquisite form in a molecule. Attempts to place different disciplines in different camps are revealed as artificial in the face of the unity of knowledge. All illiterate men are sustained by the philosopher, the historian, the political analyst, the economist, the scientist, the poet, the artisan, and the musician. From address (1958), upon being appointed Chancellor of the University of California. (1795). As quoted in André Authier, Early Days of X-ray Crystallography (2013), 313. Workers must root out the idea that by keeping the results of their labors to themselves a fortune will be assured to them. Patent fees are so much wasted money. The flying machine of the future will not be born fully fledged and capable of a flight for 1,000 miles or so. Like everything else it must be evolved gradually. The first difficulty is to get a thing that will fly at all. When this is made, a full description should be published as an aid to others. Excellence of design and workmanship will always defy competition. As quoted in Octave Chanute, Progress in Flying Machines (1894), 218.